Matthew Paige Damon was born on this day in Cambridge, Massachusetts, USA in 1970. He is 43 years old. He is the second son born to Kent and Nancy Damon. His big brother Kyle is an artist. The family lived in Newton, Mass. until his parents divorced, then Nancy and the boys moved back to Cambridge. When Matt was 10 he met his neighbor (and very distant cousin) Ben Affleck. 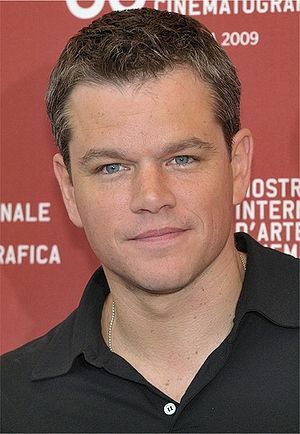 Matt attended Harvard, studying English, but left to pursue his acting career. He landed his first movie role in Mystic Pizza (1988) — a one line bit part. He had a much larger, dramatic role in the ensemble movie School Ties (1992) (School Ties is one of those movies that made just about every one in it a star.) 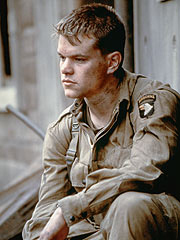 Another excellent example of Damon’s early work is his role of a heroine addicted service man after the First Gulf War in Courage Under Fire (1996). He had his first starring role in The Rainmaker (1997), a film based on a John Grisham novel. Then came the movie that “made” him as an actor and screenwriter, Good Will Hunting. Damon and Affleck wrote the screenplay for the drama (and won an Oscar and Golden Globe for their effort.) 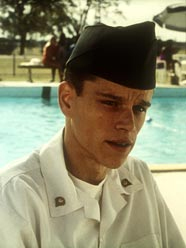 Damon’s co-star Robin Williams won an Oscar for Best Supporting Actor, but Matt lost Best Actor to Jack NIcholson (for his lead role in As Good As It Gets). He had the title role (although not the largest role) in the World War II drama Saving Private Ryan. (1998). This entry was posted on Wednesday, October 9th, 2013 at 1:47 am	and posted in Thought of the Day. You can follow any responses to this entry through the RSS 2.0 feed.